A foot spa machine or foot bath is a special machine designed to relieve muscle tension, alleviate aches and cater for most problems affecting your feet. What are these benefits of a foot spa machine? The machine works by pampering your feet, subsequently improving blood circulation and relieving numbness. All you have to do is fill the provided bucket with water and immerse your feet into the machine. The spa will release hot jets of water in a circular motion, consequently massaging your feet. Amazingly, you do not have to go to a massage parlor to enjoy the benefits of a foot bath machine. Home foot spa massagers are readily available online and in accredited stores. With this in mind, there is no reason why you should not give your feet sufficient pampering at least thrice a week. One of the major benefits of a home foot spa machine is that it improves circulation of blood throughout the body. This helps supply glucose, essential nutrients, and oxygen to vital organs in the body. Proper blood circulation goes a long way to re-energize and rejuvenate your body. These benefits of a foot spa can not be forgotten! Cases of depression and anxiety are apparently on the increase worldwide. Although various meds and therapies can help deal with these problems, taking a foot spa massage can make all the difference in relieving mental stress and anxiety. 30 minutes in a foot bath can lower your stress levels and make you calmer. Believe it or not! A foot spa session can help your body get rid of toxins. You just have to fill the container of your foot bath machine with salt water to create negative oxygen ions. These negative ions neutralize charged particles in the body, subsequently drawing toxins out through the feet. A foot spa machine helps relieve numbness, muscle ache, tension and inflammation. This also helps to hasten the recovery of foot and ankle injuries. Moreover, it also helps alleviate the symptoms of various conditions such as arthritis and osteoporosis. Very useful benefits of a home foot spa machine. If you are having trouble getting a good night’s sleep, then probably you require a foot spa massage. A foot bath machine treats insomnia and sleep problems by warming your feet and making you feel calmer, and more relaxed, thus falling asleep faster. Apart from lowering stress levels and relieving migraines, a foot spa massage will also stimulate the release of endorphins hormones, consequently brightening your mood. Giving your feet a thorough massage is very important to your health and general wellbeing. According to studies, the feet are connected to the rest of the body through reflexology. This means that if your feet are relaxed, you will feel the ripple effect throughout your body. Another benefit of a home foot spa machine. Still on reflexology, a foot spa bath can also help treat acidity and indigestion. The machine massages specific acupuncture points on the inner side of the foot subsequently releasing excess acid and helping with digestion. Most foot bath machines come with an instant heating system that allows you to control the temperature of the water in the spa’s container. This ensures that you can set the perfect temperature to suit your massage needs. Gone are the days of using analog controls. Modern foot spa machine integrates the use of digital control panels allowing you to adjust your preferred settings at the touch of a button. Various foot spas come with different massage options, including bubble, rolling and vibration massage. You can easily select your preferred massage option using the machine’s digital controls. Your safety when using a foot bath machine is of great importance. For this reason, most foot spas have multi-insulation protection to protect you from electric shock and protect the machine from damage due to hot temperatures. Some foot spas come with pedicure attachments for extra beauty services after massaging your feet. The market is flooded with hundreds of different foot spa brands. For this reason, selecting the best foot spa bath machine will always be a tough call. Nevertheless, here are a few factors to consider when buying a foot spa machine. We already know benefits of a foot spa mkey features of a foot spa but which one is the right one? A good foot spa machine should have excellent control options with a LED display that shows you the current settings. Preferably, go for a machine that has digital controls as it is much easy to use and modify. Your safety is of major concern, especially when using electrical appliances that might put you at risk of electrocution. Consider acquiring a foot bath that has multi-insulation protection and an automatic safety switch to protect you from electric shock. Different foot spa baths offer diverse massage options. While some deliver bubble or hot wave massage, others come with multi-rollers for rolling massage. Always go for a machine that offers multiple massage options for the ultimate foot spa experience. Obviously, you do not want a machine that spills water all over the floor when enjoying your massage. For this reason, always go for a foot spa bath that has a reasonable anti-spillage or drainage system. The brand is also an important factor to look at, considering the fact that it borders on quality and durability of the machine. Most people prefer home-made brands that are reputable, and renowned for quality products. If you really care about your health, then the price will not be a major issue. It is better to invest in your health rather than suffer from preventable conditions. Fortunately, foot spa machines are relatively affordable, and readily available. How Easy Is It to Use a Foot Spa Machine? Using a foot bath is extremely easy. You do not need any form of training, other than just following the instructions on the manual. Depending on the type of spa, fill the container with water, immerse your feet inside the container and turn on the machine. The foot spa will warm the water gradually and start massaging and pampering your feet using the set massage option. The Conair Foot and Pedicure Spa is designed to invigorate your feet for the ultimate massage experience. The spa comes with dozens of premium features that help relieve muscle tension, alleviate pain and suppress the symptoms of various food disorders. Notably, this Conair foot bath offers both vibration and heat massage. It comes with toe-touch controls that enable you to choose your preferred settings at the touch of a button without having to use your hands. You can also control the intensity of the massager thanks to the removable rollers integrated into the spa. If you are experiencing frequent sores, achy heels and worn out feet, then the Ivation footspa massager is exactly what you need. What are the benefits of this foot spa? This foot bath features motorized rollers that deliver intense vibration massage to enhance blood circulation and soothe your feet. Additionally, the spa is capable of producing multiple water jets, for oxygenating bubble action. This action relieves issues such as foot pain, pressure and inflammation. Remarkably, this foot spa uses the healing power of heat to help with swelling, redness and throbbing. Moreover, you can warm up your water up to 122F using the digital temperature control feature. The large LED display highlights the current settings allowing you to make adjustments as you please. Amazingly, this bath comes with 3 pedicure attachments, including a free brush, acupressure and a pumice stone, for a full treatment. You can also add essential oils and salt to the reservoir without damaging the spa. Based on all these features and benefits of this foot spa, this foot bath is ideal for athletes. Fitness enthusiasts and people who work on their feet for long hours will benefit from it. The Belmint deep water foot bath massager promises to soothe away the pain and relax your foot muscles after a hectic day. The foot bath features 6 motorized pressure-node rollers designed to knead your feet for maximum massage and relaxation. And there are more benefits of this foot spa. Moreover, it features three (3) different massage modes ranging from bubbles to heating to vibration, which you can select conveniently using the digital controls. What are main benefits of this foot spa? Interestingly, the Belmint foot spa works just like a “hot foot Jacuzzi”. It has a PTC heating semiconductor that can warm the water in the reservoir up to temperatures of 118F. This helps deal with inflammation, redness and throbbing. What is more amazing is that the reservoir is capable of maintaining the water temperature without requiring any adjustments. Another benefit of this massager is that it is highly portable. It consists of rubber wheels that enable you to slide the spa anywhere in your living room. The bath also has a drain pipe that you can use to empty the reservoir without spilling water. Although it does not have pedicure attachments, you can still use the tub as a pedicure spa. This makes the spa ideal for all types of people except pregnant women. The Conair Active Life Waterfall is a foot spa that is simple in design and elegant in appearance. The spa features amazing lights that flicker as you enjoy your bubble massage session. As the name implies, the spa features three massage options, including bubbles, waterfall and heat. You can switch in between your preferred massage options using the 3 toe-touch push buttons incorporated on the machine. Unlike most foot baths in the market, this spa consists of exfoliating loofah disks that you can use to rejuvenate your skin. The unit also comes with massaging foot rollers that you can easily use to soothe the soles of your feet. This foot bath is ideal for people with extremely active lifestyles. For this reason, it features 3 pedicure attachments, including a scrub brush, a soft-touch massager and a pumice stone. Importantly, the spa is designed to maintain the temperature of water in the foot bath for maximum relaxation. The Kendal All-in-One Foot Spa prides itself as the safest massager in the market today. The foot bath features an electric leakage protector that prevents the reservoir from spilling water and safeguards your feet from shock. Furthermore, the body consists of high-quality plastic that is extremely durable and resistant to high temperatures. Amazingly, the spa features multi-insulation protection that maintains the temperature of water in the reservoir. Moreover, the unit allows you to change the temperature of water thanks to the PTC heating semiconductor installed on the machine. Notably, this All-in-One foot spa bath massager offers both heating therapy and bubbles massage, helping eliminate exhaustion and improve blood circulation. All you have to do is fill the reservoir with warm water and immerse your feet. Interestingly, the spa has a timer that you can use to determine how long you want the massage to go. Lastly, the foot bath features removable rollers that come in handy when you want to massage your soles or alleviate heel pain. You can always rely on this spa for all your massage needs as it is ideal for both men and women of all ages. This foot spa offers plenty of benefits. The MaxKare 3-in-1 foot spa is a unique massager designed for both men and women with active lifestyles. The spa offers a variety of amazing features for the perfect foot massage. Firstly, it comes with three massage options, including heating, bubble massage and intense vibrations. Amazingly, you can enjoy the 3 different massage functions individually or all at once. As if that is not enough, the foot spa features intelligent temperature control with digital displays that effectively allows you to set your favorable settings up to 118F. Once you achieve the desired temperature, the machine will maintain the heat with no need to add hot water. Heating is definitely one of benefits of a foot spa Maxkare. Furthermore, the MaxKare foot spa includes 4 removable massaging rollers that effectively knead the soles and heels. The rollers apply pressure to all the accu-points on the soles, providing pedicure services for maximum comfort and relaxation. However, the only downside is that these rollers are not motorized. Nevertheless, you can remove the rollers at anytime if you do not need them. The good thing is that this foot spa has an FDA certificate showing that it is safe for use. The massager is ideal for all ages as it fits feet up to size 15. 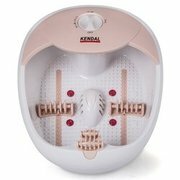 This Kendal All-in-One massager is designed for people with large feet who would love to experience the pampering that comes with a foot bath. The spa is sufficiently large, and it features an anti-splash cover that prevents water from spilling to the floor. In terms of functionality, the Kendal all-in-one massager offers three massage options, including HF vibration massage, heating therapy and oxygen bubbles massage. The spa also features two massage rollers and nodes that promise to soothe your soles and ease your heel pain. Moreover, the tub consists of premium plastic materials that are resistant to high temperature and aging. This means that the spa effectively maintains temperature without requiring you to add hot water into the tub. Furthermore, you utilize the digital controls to set your preferred temperature up to 118.4F. Digital controls and heating are these essentials benefits of foot spas. Another benefit is that it features an built-in digital timer that can be set for 20-60 minutes. This allows you to enjoy your foot bath session without glancing at the clock or setting the alarm. The HoMedics Foot Spa is a simple, but an exceptionally effective massager. The spa is highly renowned for its ability to heat water in a matter of minutes while maintaining temperature at the desired level. Furthermore, it offers all types of popular massage functions, including bubble therapy, heat therapy and vibration massage. With a convenient toe-touch control, you can switch between the different functions easily for a splendid massage experience. This foot bath is lightweight and extremely portable as it contains a carry handle that you can use to transport the spa effortlessly. It is perfect for men and women of all ages, but not ideal for expectant moms. The Revlon Invigorating Pedicure FootSpa is yet another simple massager that you should consider for your home inventory. The spa comes in an elegant design that is sure to grab your attention. Just as the name suggests, Revlon invigorates your feet subsequently relieving pain, fatigue and muscle tension. And benefits of this foot spa? The foot bath offers soothing massage, bubble therapy and heating therapy. Furthermore, it comes with pedicure tools, including a massage brush, a nail cutter and a pumice stone among other items. The 5-piece pedicure set guarantees a total spa oasis. Nevertheless, the most interesting feature about this footspa is that it uses Smart Heat technology to maintain the desired water temperatures for long periods. However, users should note that this feature does not heat cold water. Seemingly, you have to pour hot or warm water into the reservoir to enjoy your massage. Moreover, it is simple and easy to use by all ages, including expectant moms. This means it can serve the whole family, hence no need to buy multiple units. However, you should not use high intensity when massaging your feet if you are pregnant. 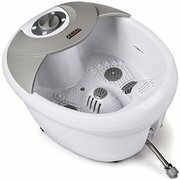 The Best Choice Products Foot Spa is an easy to operate and highly portable foot bath. It features 3 different massage functions, including oxygen wave massage, heat therapy and vibration massage. Nonetheless, the most interesting part is that it comes in a roller design that soothes foot acupuncture pressure points. This helps reduce stress and improve blood circulation. 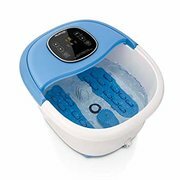 Another exciting feature is that this foot spa comes complete with a digital timer, adjustable heating and an extra option for oxygen waves. You can set temperatures of up to 118.4F and enjoy uninterrupted massage sessions going for 10-60 minutes. Furthermore, it has an easy to use intuitive display that allows you to monitor heating, temperature, time and other preferred settings. Unlike other foot spa massagers, this product benefit of a red light therapy, which helps smoothen the feet and promote healing. The best part is that it is highly portable as it comes with roller wheels and carrying handles. The foot bath also has an effective drainage system that ensures water does not spill to the floor during and after the massage. Our final pick is the HoMedics FootSalon Pro Foot Bath. This unit comes with plenty of premium features that will certainly ensure that your massage session goes according to plan. The spa can heat water filled in the tub within a matter of minutes thanks to its Heat-Boost Power feature. Furthermore, it supports maximum temperatures of up to 98F, which is favorable for a splendid foot massage experience. Besides providing heat therapy massage, the foot bath has 4 vibrating node rollers that provide the perfect kneading massage to soothe your aching soles and arches. It also has a bubble function that releases fizzy oxygen bubbles for optimum relaxation. What is more amazing is that this foot bath comes with 4 pedicure attachments stored in the built-in storage compartment. These attachments include a massage roller, a rough pumice stone, smooth pumice stone and a massage roller. In terms of safety and protection, this foot bath comes with an integrated splash guard to containwater from spilling all over the floor. It also has toe-touch controls that you can use to power the unit and set your preferred functions. You will love the simple and beautiful design as well as the performance of this foot spa machine. We have prepared the full review of the Kendal MS0810M. The product comes with features you can read about in kendal ms0809m review. The review of the NURSAL foot spa. NextFoot spa while pregnant – safe or not ?